A Neti Pot is used for Jala Neti, a very old cleansing technique of the Hatha Yoga tradition of India. The literal translation of the Sanskrit term means "water cleansing“. The newly established modern word for Jala Neti is nasal irrigation. 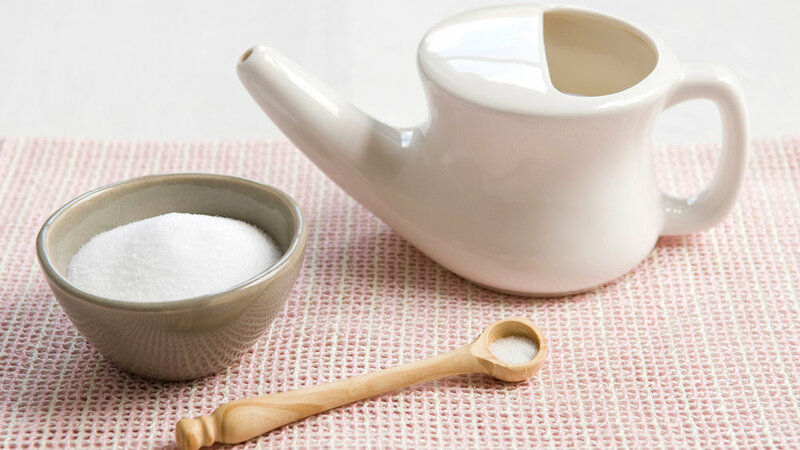 The Neti pot is filled with a body-warm saline solution of the same concentration as the body fluids. With this solution the nasal cavities are rinsed so that the salty water goes in through one nostril and comes out to the other. A more advanced technique is letting the water in through one nostril and out through the mouth. This is hardly felt if the salt concentration, water temperature and technique are good, for sure there is no pain or uncomfortable feeling involved. In the yogic tradition, Jala Neti is performed every morning with the daily routine such as tooth brushing. It can be performed more often if you work or live in a polluted area or have health problems such as hay fever. The solution you use should have 0,9% of salt, like the body fluids do. Some Neti Pots have a spoon to measure this exactly. If yours does not have such a spoon, you can start by taking 500 ml of water and add one teaspoon of salt, this is about 0,9%. Once you know how it should feel, you will find out how much you need for your own Neti pot. If it is easier for you, you can use the taste of the water to find the same concentration every time. Take body-warm (spring or distilled) water for Jala Neti. Pour some drops on the inside of your wrist to see if the water has the right temperature, the hands are not sensitive enough. It is better to have the water a little bit too warm than too cold. Mix well so that the salt is diluted completely. You will find all this out with growing experience; it differs from person to person. Some like a higher saline solution, some even do it without salt. The tissue of the nose is very sensitive and reacts immediately if something is not right. This shows you if everything is fine. If you take the described solution and temperature, there should be no uncomfortable feelings at all. Fill your Neti pot with solution and stand in front of the sink. Bend over the sink and breathe naturally through your mouth. By opening your mouth wide enough, the passage from the nose to the mouth is closed. No water can get into your mouth or your throat. Don't talk or laugh, no air should come into your nose now. There won't be a feeling of having water in the airways if you pay attention to this. Now put the nose cone into your right nostril and seal it with some gentle moves so that no water is coming out of this nostril. Then gently bend your head forward and roll it to the left side. The left nostril should be the lowest point. Forehead and chin should be about the same level. You need to experiment with the posture of your head. Once the water is coming out of your left nostril, hold your head and only move the Neti pot to keep the water pouring in. You should start with half a pot per side. For this wait about 20 seconds and remove the nose cone out of your right nostril. If you practiced with half a pot fir some time, you can use one pot per side. Bring your head to the middle and let all the water flow out. Blow gently with both nostrils. You should not close one nostril now and you should not blow. This can bring the water up in you ears where it cannot dry correctly. Repeat the procedure with the left nostril, doing everything in the opposite direction. When you finished let all the water flow out again and gently blow the water out of both nostrils. You can roll your head in every direction and let it hang and move it then to get all the water out. Drying up the nose is very important and should not be neglected! If you have a mucus blockage you can go back and forth for some times. Make sure that the water, which has entered the nose, does not flow back in the Neti pot. Therefore put the cone in your nose, pour some water in, remove the pot and let it flow out again. If you have problems doing this alone, you can ask people who practice yoga or give yoga classes to show you. Most yoga practitioners will know this technique. If you try it for some time and the water does not come out of the other nostril, you should ask a doctor for advise. There could be some type of anatomical blockage. Moistens dry nasal cavities and passageways, add a small ¼ tsp of melted ghee for vata conditions.